Take care of yourself Everyday! Not just once in a Blue Moon. Also check out our selection of Bio-Hazard Containers for safe and easy disposal. 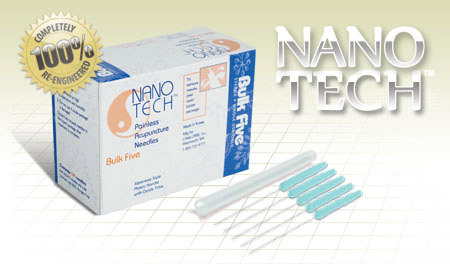 Precisely calibrated for ease and accuracy, Nano Tech Bulk Five needles have been completely re-engineered for a painless acupuncture experience for you and your patient. These sterile, disposable, surgical stainless steel acupuncture needles feature an easy-to-hold, color-coded 25 mm patented Vibration handle. The economical bulk packaging with 5 needles and one guide tube per blister package allows for easy use with less waste. Box of 500 needles (100 packs of 5 needles with tube). the order of a licensed or qualified practitioner.